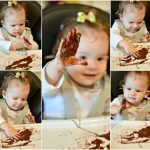 Well, there was a few for our sweet baby. Why? I’m Halloween obsessed! Halloween is SO important to me. It was actually my family’s favorite holiday. I grew up with my dad having boxes and boxes of decorations. Our house was decked head to toe in Halloween decor. I really miss all our traditions and I’m so excited to follow them all with Sweet Baby too. 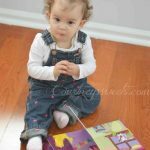 She’s already a huge fan of Halloween and we just love reading Halloween books lately. 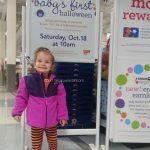 I can’t wait to head to Babies “R” Us and look at all the Halloween costumes, outfits and toys! We’re going to have an absolute blast! 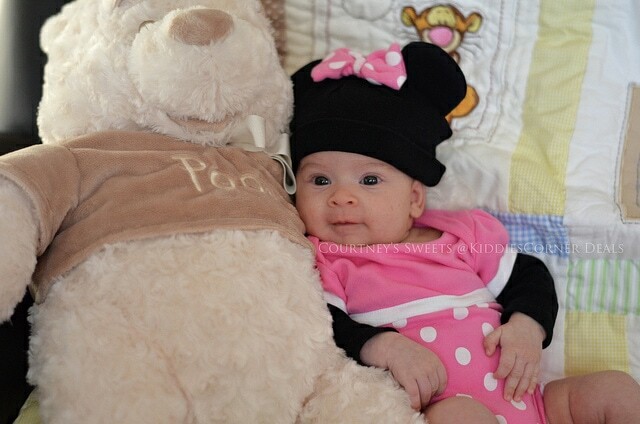 There was the time we dressed her up as Minnie Mouse – obviously the cutest mouse ever! Then we even dressed her up as a cat, however we weren’t total fans of the costume.. so it didn’t last too long. Baby will still be a bump this halloween – I’m not doing a bump costume 🙁 My daughter’s first halloween was a princess and my son’s was a bear! Dylan is going to be a dragon for Halloween! I am not sure yet but probably a little pumpkin or Bam Bam. My son’s first costume was Obi Wan Kenobi and I made the costume!!! My lo will be Pooh’s honey pot! Both my boys dressed up in a really nicely lined hot dog costume from Old Navy for each of their first Halloween. Still not sure yet as I am a last minute kind of shopper! 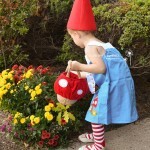 I do love Halloween so I am excited to see what costumes I will get my kids this year! She will be a baby panda! Those costumes are so cute! Dressing up for Halloween is one of my favorite parts of the holiday! My son was a Hershey’s chocolate kiss for his first Halloween. 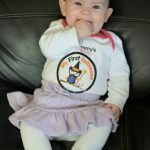 My baby was a pumpkin her first Halloween!! My daughter was a bumble bee her first year. 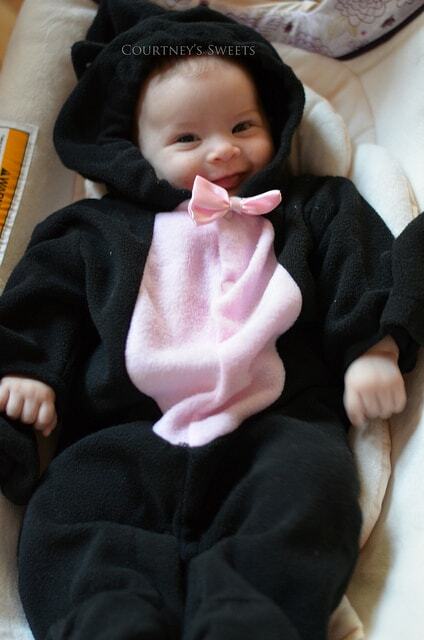 My niece will be a panda! My baby dressed up as a giraffe. 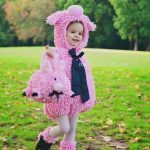 My daughter was a pink poodle. She is just too cute for words. Absolutely adorable! I am planning on dressing my 1 month old as a pumpkin. My oldest was a kitty, my son was a pumpkin, 3rd was a ladybug and my youngest is going to be an owl. 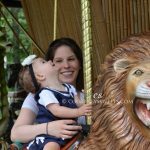 The first costume was when my baby was a little lion. He was so adorable. My little girl first costume was a mermaid. She’s adorable in all the outfits, so cute I love Halloween. She is just too cute! We love Halloween here the costumes are a huge part of it. It seems like just yesterday your little one was that tiny little costumed doll. I think first costumes are just the cutest thing! I don’t remember my daughters ever dressing up for Halloween — tho they dressed up a lot. So cute. Mine was a tiger. My daughter is going as her favorite cartoon character-Minnie mouse!! My son will be a pirate its his first Halloween. My daughter’s first costume was a pumpkin! Oh my gosh, how cute is she! She looks so sweet 🙂 What a wonderful time, and I remember the days of explosive poo well, blah! He was a pea in a pod. My daughter’s first costume was a bumble bee! My son is going to be a lion. My niece will be Tinkerbell this Halloween. 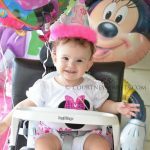 I don’t have a baby, but my niece’s first costume was minne mouse, she was adorable! My grandson’s first costume was Woody from Toy Story. My oldest was a Giraffe, my middle child was a baby Batman and my youngest was Minnie Mouse. The giraffe and MM were both bought from Babies R Us! He will be a minion! My son was a monkey! I want to dress my 4 month old baby girl like a little peacock. He is going to be a cow! My grandsons first costume was a pirate, he is going to be Frankenstein this year. My son was a pumpkin. She is going as a lady bug! My son is two! His first Halloween he was Robin (his dad was Batman, I was Catwoman). His second Halloween he was Rick Grimes from The Walking Dead and we were zombies. This year he’ll be Captain Kirk as we all will be Star Trek characters! My daughter was a cabbage patch doll. My youngest was Minnie Mouse last year, for her first Hallowen! the first halloween costume was snow white! so cute! My daughter was a ladybug when she was a baby. My granddaughter’s first costume was a Pea in a Pod. She was so cute. Baby Girl will be 7 days old! 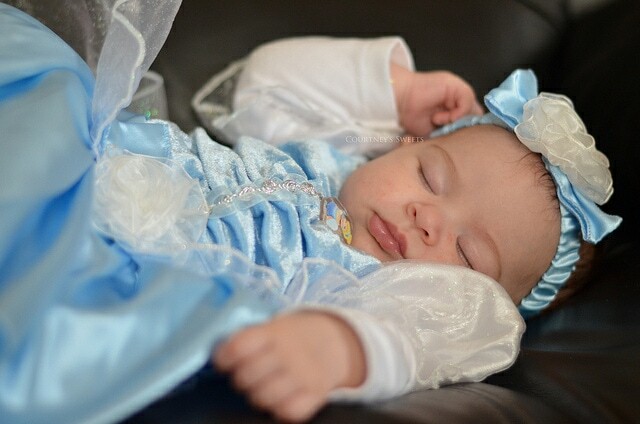 I think she will be a sweet princess for her first Halloween! my youngest sons first costume was a angry pig. the baby I am currently pregnant with is not due till march so not sure on halloween costume yet. I think a disney princess but not sure. this will be my youngest son’s first time dressing up and he is going to be a minion. My 3-month old daughter is going as a little cow.